Ahh, New York City rooftops. The proud land of movie-watching, breathtaking views, sunbathing, and barbecues. And now rainbow chard. Rooftop farming is here. Well, it's actually been here for a while. It just hasn't exploded yet. But did you know there's already 43,000 square feet of roofspace in the Brooklyn Navy Yard dedicated to this green venture? 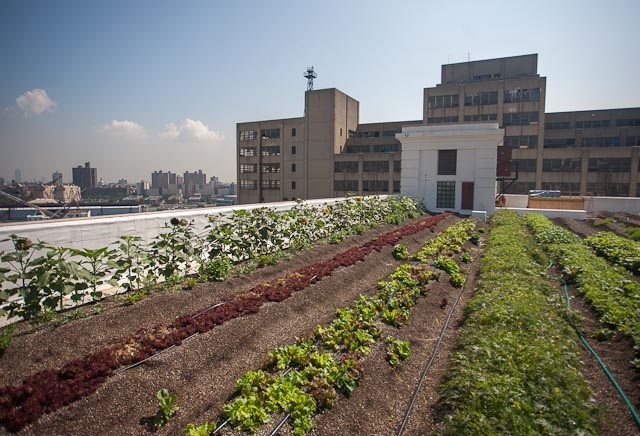 Brooklyn Grange, the city's largest rooftop farm, is growing salad greens, rainbow chard, kale, basil, and other veggies in its own backyard. And you can find their produce anywhere from farmer's markets to supper clubs to their own CSA. I think this is an awesome idea, and I love the environmental benefits, which include building insulation from heat and cold and massive storm water absorption. The NYC Green Infrastructure Grant Program is what got projects like Brooklyn Grange off the ground, so to speak. And it just underscores one of the strengths of the Bloomberg Administration, which has made the environment a pretty big deal through extensive tree planting, hybrid taxis, more bike lanes, and supporting green development projects like the High Line and Brooklyn Bridge Park. Today, Brooklyn Grange was featured in Gothamist, and the article includes several images worth checking out. Calvin, Chicago has tons of rooftop gardens. In fact city hall has a wonderfully large one!